Mizuho Sakaguchi and Rumi Utsugi of Japan celebrate after their semifinal win in the Women's World Cup. The United States had already punched its ticket to the Women’s World Cup Final with a win over Germany on Tuesday night. 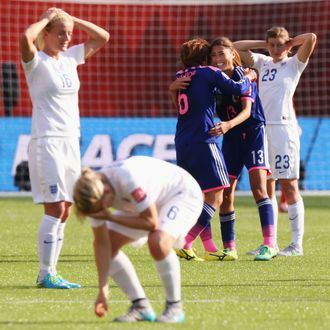 Last night, they learned their opponent: After more than 90 minutes of tight play in the semifinal between England and Japan, England lost in perhaps the most devastating way possible: an own goal by Laura Bassett during stoppage time that handed Japan a 2-1 victory.